In fact, probably to no one's surprise, he had the fastest time on cross country. Great picture. Very happy to hear that he is doing so well! He is such a fantastic example of what OTTB's can do. He excelled tremendously as a racehorse, and now he is excelling at cross country. I love seeing him do so well. At the end of his racing career, he was given to Graham and Anita Motion and they are very involved with his new career. Anita goes to Dutton's stable and regularly videos Icabad's training sessions and then posts them. Icabad seems to be part of their family. Icabad's progress is not hindered by having an Olympic rider/trainer. But the talent and attitude all come from inside the horse. For him to have gone from Beginner Novice to Preliminary in a little over a year is amazing. It's all there. If he wasn't sound enough, athletic enough, or as competitively-minded as he is, he wouldn't be doing it. It's just really special to see. i have an OTTB and he is a wonderful horse, will give me his everything even when he's a bit unsure. They truly are the best horses. Per Phillip Dutton Eventing: "Icabad Crane is officially a Prelim horse! 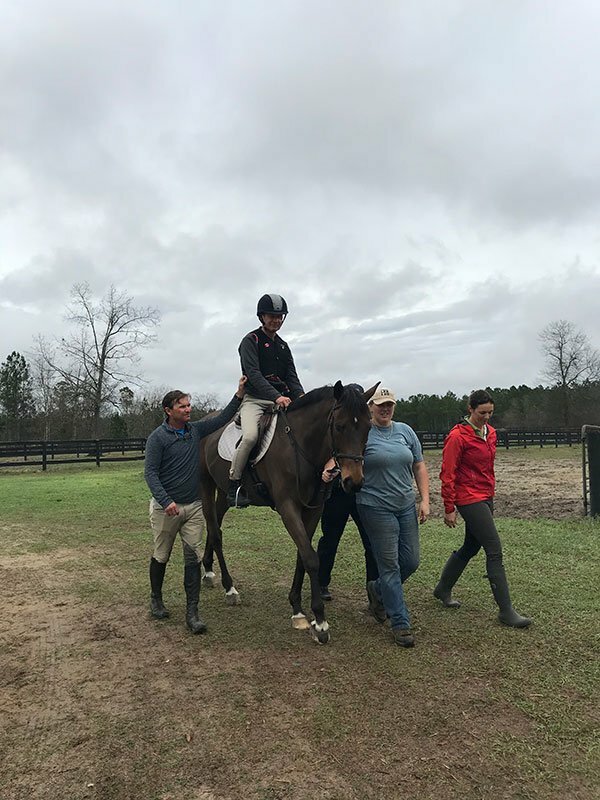 He placed third today (feb. 25) at Full Gallop Farm Horse Trials in his debut at the Preliminary level, finishing on his dressage score of 30.0. He was the fastest horse on cross country in his division by 36 seconds — I think he had fun out there...I’d like to think that at the higher levels he’s going to be even more competitive when the fitness and endurance on cross country matter more. This is his career now, and we’re committed to taking this as far as Icabad wants to go. If today is any indicator, this journey is far from over. Thank you to Barry Bornstein for the great photo of Icabad at Full Gallop today." So happy to see this horse doing well. Actually Dutton was given another horse before Icabad. He didn't have the talent or desire that Icabad does. This dicipline is not for every horse but it's nice to see that for some they can excell at multiple things. Icabad won his first preliminary eventing title at Shawan Downs this Saturday. I don't have the placings to post here but they are on his Facebook page. Icabad just won his first CIC one star event at Plantation Fields today with a double clear and running the X country 19 sec under the time! He is a true up and coming STAR! See Phillip Dutton Eventing Facebook page for nice winning photo. Squeaky wrote: Icabad just won his first CIC one star event at Plantation Fields today with a double clear and running the X country 19 sec under the time! He is a true up and coming STAR! See Phillip Dutton Eventing Facebook page for nice winning photo. So excited when I saw this on my FB feed. Well done, Icabad and team! Lovely photo of Icabad on Phillip Dutton Eventing's FB page. Thank you to Charlie Mann and AK Dragoo Photography for this composite photo of Icabad Crane jumping the final water complex on cross country at Plantation Field Horse Trials! — with Charlie Mann and Amy Dragoo. Icabad finished fifth out of over 50 horses in a large and competitive field of eventers in his first CCI* at the prestigious Hagyard 3 day event in Kentucky at the horse park. He had a very good dressage score, was clear, fast and inside the time over a big and demanding cross country course, and had one rail down over a difficult stadium jumping course. Tomorrow he will do a demonstration at this year's Thoroughbred Makeover competition, and Phillip Dutton will present the trophy to this year's winner. Go Icabad! Thought I'd resurrect this thread with a nice story about this team. Two-time Olympic gold medalist Phillip Dutton has long been an advocate of off-the-track Thoroughbreds for competition in eventing, which tests a horse’s athleticism, versatility, stamina, and courage through tests in dressage, cross-country, and stadium jumping. That love for the breed, along with skill in the sport, runs in the family. Dutton's teenage daughter Olivia recently rode one of the stable’s most familiar names, classic-placed Icabad Crane, to victory in the Junior Open Training division at Fair Hill International's August horse trials. I like online betting. I'm into sports right now. Too bad I don't even know how to play here. Do you know those rules? Love this photo of #OTTB Icabad Crane toting around Peter with the utmost care. Icabad finished 3rd in the 2008 Preakness for trainer @GrahamMotion and owner Earle Mack. @HerringswellStb was instrumental in placing the horse with Olympian Phillip Dutton.